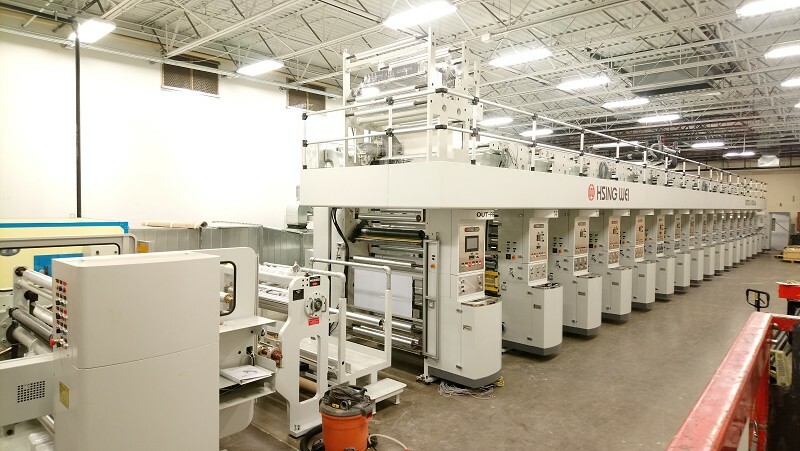 In September 2018, a HSING WEI rotogravure was installed in USA which is the first set of 14 colors rotogravure press running in the country. This mainly supplies products for global companies; such as 3M, Coca Cola, Nestle, Unilever and other well-known international companies. Due to the high demand in the United State, our customer has decided to purchase a 14 colors with BST eltromat register controller from Germany, Enulec ESA (Electrostatic assist), Germany and 100% print inspection, web video and other functions for their special projects. Hsing Wei machine offers cost effective rotogravure printing machine technology that will help customers to reduce job change over time and increase productively with an extremely high level of precision. It’s more important then mc amount. Because HSING WEI machine enables customers to work highly efficient and run for 24 hours daily. We customize machine to fit your needs and we believe that only customized will be able to handle special projects and finds suitable solutions for your demand. If you have any questions regarding rotogravure printing press, please contact us at sales@hsingwei.com Hsing Wei Machine Industry Co.,is a leading manufacturer of ROTOGRAVURE PRINTING MACHINES with over 40 years of experience. We are now introducing the 14 colors rotogravure machines into the USA market , which is also the very first 14 color machine in the USA. This rotogravure printing press is manufacturing by Hsing Wei Machine in Taiwan. If you are looking for 14 colors rotogravure printing press, please contact us for 14 colors rotogravure information.